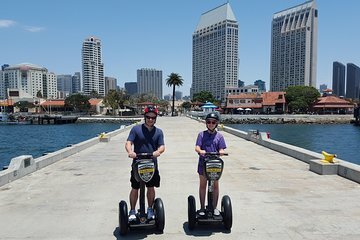 Verken het historische centrum en de waterkant van San Diego op een leuke, milieuvriendelijke manier tijdens een Segway-tour in de ochtend. Versla de drukte en vermijd het gedoe van het rijden terwijl je door het charmante Gaslamp Quarter en langs de haven rent op een zelfbalancerende elektrische scooter. De tour omvat 30 minuten training en oefening, zodat je vol vertrouwen kunt rondkijken in een van de meest leefbare steden van Amerika, terwijl een gids onderweg interessante anekdotes en geschiedenis deelt. A must go tour if you are new to the city and never ride segway before. We booked the tour for our group of 8. Since it was a Holiday and the tour started early at 8AM, we had the empty streets to roam and it worked out better since this was our first time riding the segway. After 30 minutes into the tour, we felt like segway pros. Our tour guide, Johnny handsome, is the best. He made the tour so much more fun and took good care of us. We could see a lot more of the city with the segway since we covered more grounds than walking. If this is your first time to the city, take the tour, see where you like to visit and come back later on on your own. We would definitely do this again with the 3 hours Balboa tour. Worth every pennies. Don't forget to take care of our tour guides and show your appreciation for their services. Excellent tour. Our guide, Chris, was extremely patient and thorough in teaching us to ride the Segway. We had a great tour of downtown and the waterfront. He stopped at places for photo ops and was very open to questions and comments.